Wild Alaskan Salmon is one of the top anti-ageing sources of protein you could possibly eat! Made rather famous by Dr Nicholas Perricone, who recommends eating rather a lot of it to give your face a noticeable lift! Celebrities like Kim Cattral have used this technique before big events to slim down but also firm and lift the skin. Dr Perricone recommends eating it a week or 3 days before a special event, and you must eat it first! before anything else. 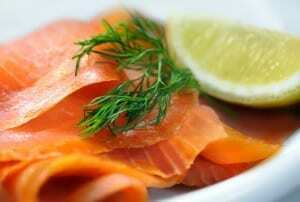 Why is Salmon so Skin Friendly? Wild Alaskan Salmon contains DMAE, a powerful antioxidant that has the ability to stimulate nerve function, so your muscles contract and tighten your skin. It can prevent, what is clinically known as “Anatomical Loss of Position” – that’s a sagging face to me and you! It is also high in the antioxidant “Astaxanthin” which gives the natural red colour to Wild Salmon (as opposed to dye in farmed salmon). Astaxanthin comes from a type of red algae that the Salmon eat, then passes up the marine food chain. So if your skin needs to look extra wonderful, try and follow the Perricone Prescription – even if it is only for 3 days! you will see a difference in the smoothness of your skin and everyone that I know has done it has said how fresh their eyes looked.! We should all aim for 3 portions of oily fish a week, so if you don’t like Salmon, try Sardines and Mackeral which are also rich in DMAE, or if you don’t like any fish then try taking DMAE and OMEGA 3 supplements or you could add a marine extract collagen to your diet.